On CentOS, the SSH server is already running and already allowed through the firewall; it is running version 5.3p1. As noted earlier, the Ubuntu firewall is off by default; if you have enabled it, then you must open the necessary port. Getting the SSH server onto the Ubuntu Server system is complicated by the fact that it has no GUI, so the usual trick of dragging a file from the host and dropping it on the desktop of the guest will not allow us to copy the files. We could set up a web server or an ftp server, and use client software like wget on the server to get the files; we have already seen how to do that with Python. We could also take the server out out of the lab to an Internet connection and use ftp and/or wget. There is another approach. From VMWare, select VM, then Settings. Under the Options tab, select Shared Folders. Select Add; then you can choose a folder on the host that will be mapped to a folder on the guest. 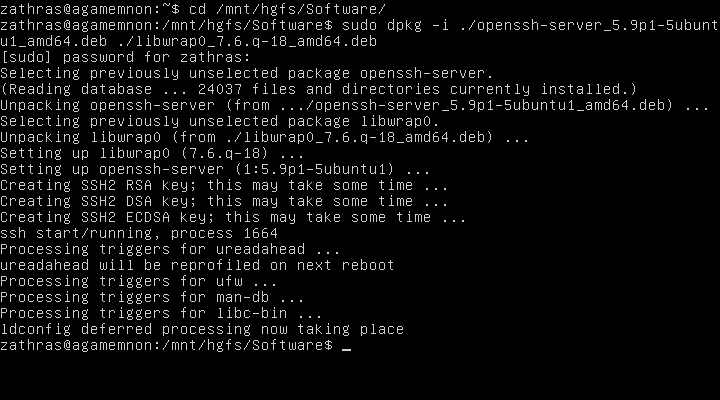 To actually install the SSH server, we need two packages- the server itself (openssh-server_5.9p1-5ubuntu1_amd64.deb) and the package libwrap0_7.6.q-18_amd64.deb. Install them both via dpkg. Mint 13 Cinnamon also does not come with an SSH server by default; however since it is a variant of Ubuntu, it can be installed using the same method and package as on Ubuntu. The Mint 13 KDE system does have an SSH server already started. An SSH server can also be installed on a Windows system. My preferred method for doing so is to use Cygwin, which provides Windows ports for a large number of Linux applications. The catch though, is that though it is possible to install and use Cygwin on systems not connected to the Internet, it is difficult, especially for beginners to Cygwin. Rather than go through that trouble, let me offer as an alternative FreeSSHD. It is older, but it is free and (mostly) works on Windows systems. Installation is standard, though I should note that I have had nothing but bad luck when I installed the tool as a service. The icon on the Desktop starts a tool to control the server; this controller lives in the System tray. Another place I have run into trouble is starting another instance of the controller when one is already running; because the system tray hides the FreeSSHd icon by default, this has happened embarrassingly often. Note also that you need to manually specify which users are allowed to use the SSH server. They can be domain users if you wish, but you can also create new users that are not connected to either a domain account or a local Windows account. On Linux systems, simply use the built-in command line client to connect to a remote SSH server. The best client for SSH from a Windows System in PuTTY. It is available on the lab share and online. Its general use is straightforward- enter the required connection information in the box and select Open. You can save the profile settings by simply giving it a name and choosing Save. We can do this manually now, but there is a method to do this at the same time the keys are copied to the server. 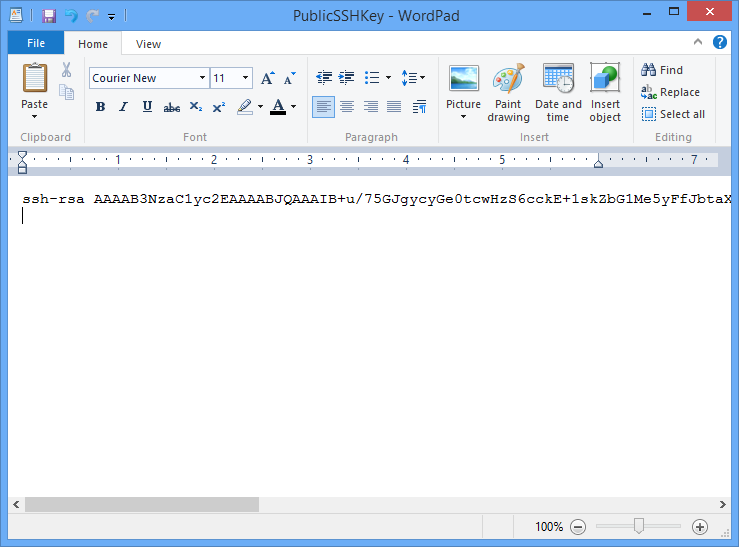 A user that wants to connect to a client via PKI must first generate the keys that will be used for the connection via ssh-keygen. Your identification has been saved in /home/zathras/.ssh/id_rsa. Your public key has been saved in /home/zathras/.ssh/id_rsa.pub. Note that zathras did not use a passphrase to secure the keys. To use SSH PKI, we need to copy the public key (ONLY) to the server; the content of that key needs to then be appended to the file ~/.ssh/authorized_keys on the server for that user. Note that the username on the client and the username on the server can be different. We can do this manually a number of ways, including using SSH with a password. However, there is a tool that will do this automatically for us, and will even ensure that the server’s directories and files have the correct permissions. The authenticity of host 'acheron.cosc.tu (10.0.2.100)' can't be established. RSA key fingerprint is 5a:b1:0d:b1:a0:ad:05:6c:28:51:ff:15:df:53:9e:1e. Once this is complete, zathras on alexander can SSH into acheron as valen without using a password. Since PKI has been setup already, no password was required, and the result of the command is simply dropped to our screen. If we had not set up PKI, then we would need to enter our password each time we wanted to execute a command. zathras@alexander ~/Documents $ ssh valen@acheron.cosc.tu "ls -al /home/valen"
drwx------. 5 valen valen 4096 Feb 14 11:49 .
drwxr-xr-x. 4 root  root  4096 Feb 14 11:40 .. 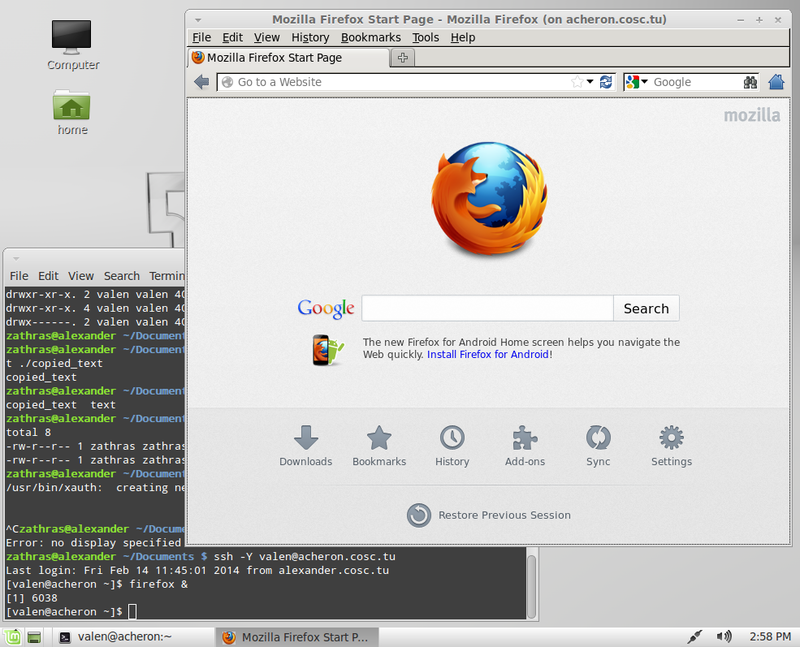 Suppose that there is a graphical program like firefox on your remote host. You can run it remotely, provided you pass the "-Y" flag. 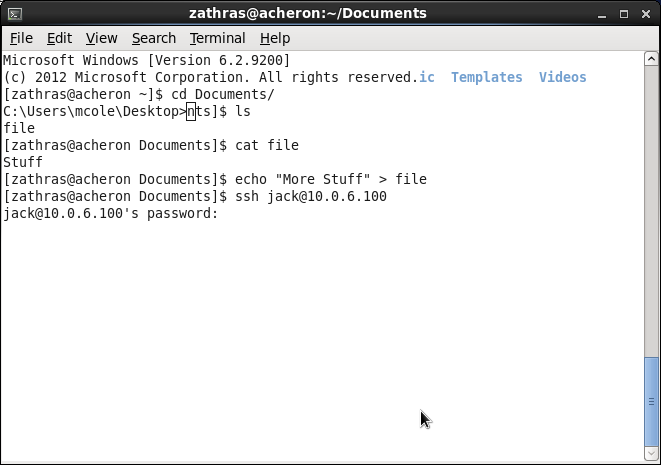 Here is a screenshot of the user zathrad on the Mint 13 system alexander logging in to the CentOS system acheron as valen, and then calling Firefox from the command prompt. We can also use PKI with PuTTY. Start by running the PUTTYGEN key generator program; be sure you select SSH2-RSA for the key type, as there are weaknesses with the other approaches. Save both the private key and the public key. We don’t have the simple technique to add the public key to the remote server that we used before, however we can use SSH with a password, then copy and paste the public key on to the server. Unfortunately, the format that PuTTY uses is not one well suited to copying. Here we see two RSA keys, one for the user valen on the host alexander.cosc.tu, and a second for the user root on the same host. We need to modify our PuTTY generated key so that it has the same format; is needs to start with the text ssh-rsa and should end with the user and host that has the corresponding private key; the commented lines need to be removed. Further, the result needs to be on a single line with no newlines. Even better, if you open the public key with a simple text editor like Notepad, you won’t even realize that the key is split over multiple lines, so and copying it becomes even more trouble. Save the result. To log in using this key, specify the user name in the Data dialog box (beneath Connection), while the location of the private key is specified in the Auth dialog box (beneath Connection, beneath SSH). Given the settings in different places, I recommend that you save your resulting configuration (in Session). Opening the connection will then give you access to the remote server without a password. SSH can also be used to create tunnels, but we don’t have time to discuss SSH tunneling in the detail it deserves. to the sshd_config file. Note that the default state is to allow root logins; in the CentOS 6.2 default configuration file a commented out line allowing root logins is present, while on the Mint 13 / Ubuntu 12.04 default configuration files the line is present and explicitly allows root logins. will allow only the listed users to be able to SSH into the machine; other users (e.g.mcole) would not be able to log in. Though using a white list of allowed users is generally preferred, you could create a black list of users not allowed to log in via the DenyUsers directive. to ensure that the system does not fall back to SSH-1. Then any ssh connection attempt from other than 10.0.2.3 or 10.0.2.13 will not even receive a response. You are encouraged to read the manual page for hosts_access to learn more about the syntax for these files, and to learn other options. Microsoft Windows operating systems are designed to allow users to share files and folders. 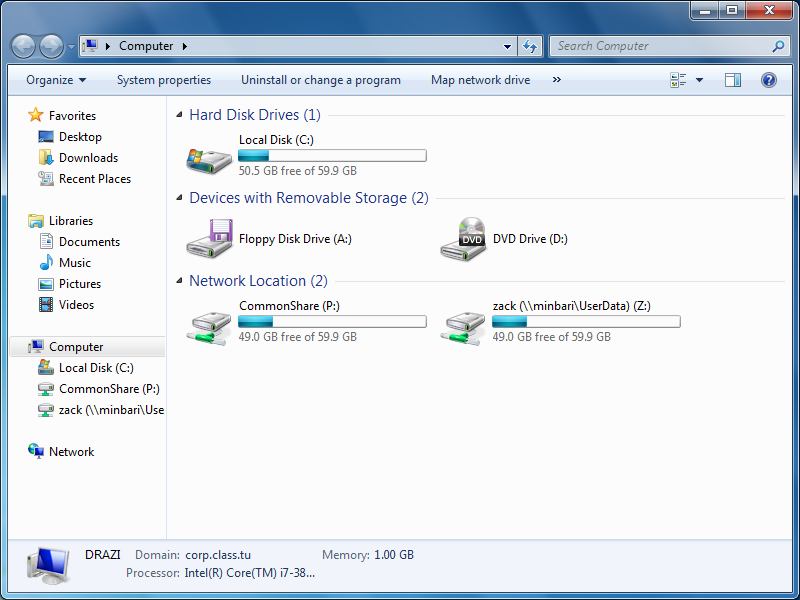 Creating a file share for a Windows 8 system connected to a domain is actually quite simple. 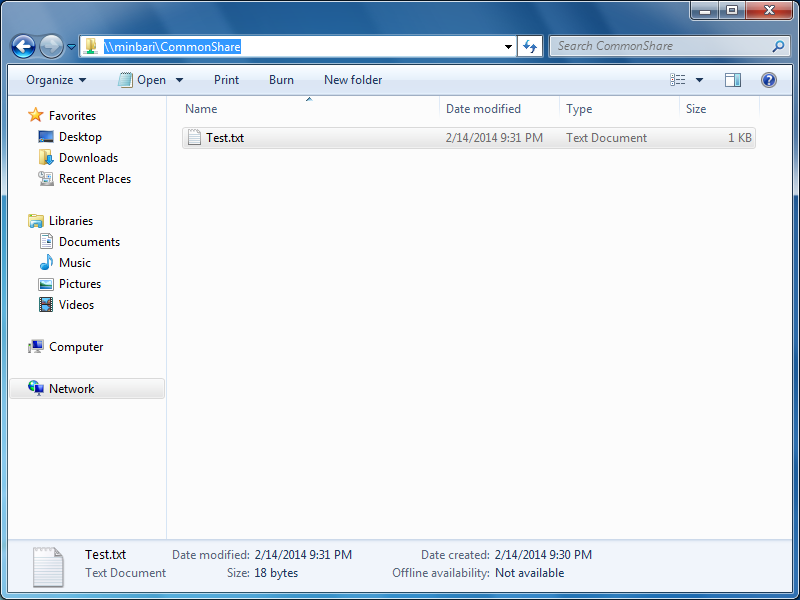 Suppose that the domain user Marcus Cole has a folder called "Shared Folder" in the Documents Library. To share that folder, simply navigate to that folder and select Share, then Specific People. 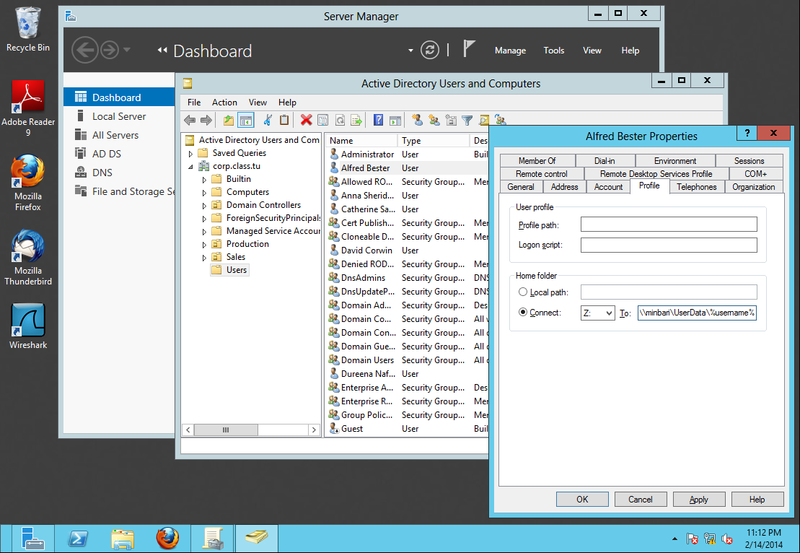 You can then grant permissions to user(s) and group(s) defined on the domain controller. So, for example we can give particular domain members permission to read the directory, and all members of the sales admin group (which we created in our discussion of group policy) both read and write permissions. Create a folder; navigate Folder (right click) → Properties → Sharing → Sharing. 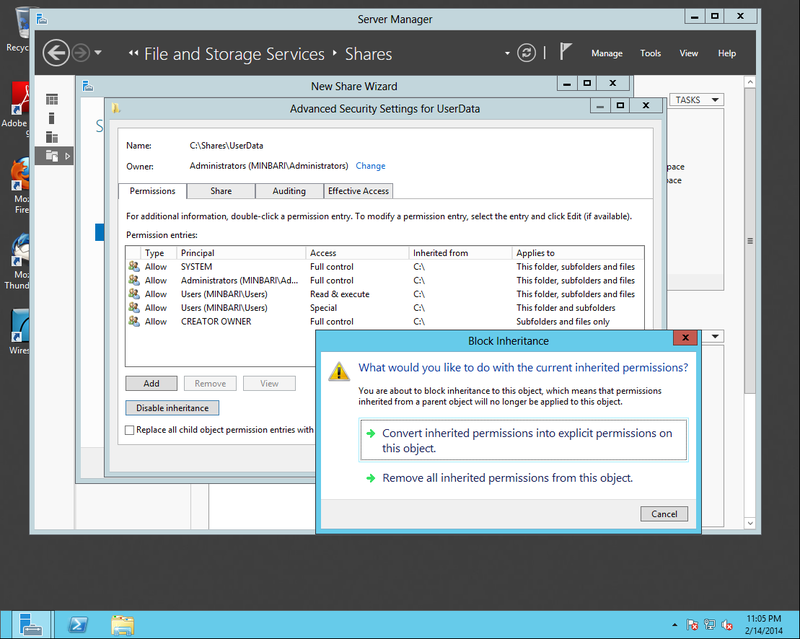 Specify the Share name, and the permissions of the users allowed to access the share. One apparent difference is that an administrator password was required for Windows 7 but not for Windows 8 to enable the share. In most large organizations however, file shares are provided centrally as part of the overall network infrastructure and run from a file server. 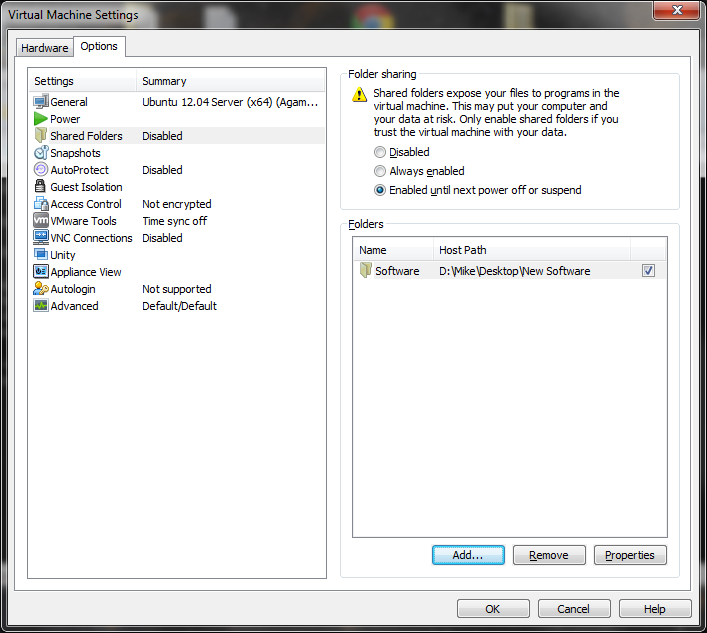 In this example, we will set up a Windows 2012 system as a file server. This system will be a domain member, but will not be a domain controller. In this example, the system will be named minbari.corp.class.tu; it will be a member of the domain corp.class.tu, which has brakiri.corp.class.tu as the domain controller; the system will live at the IP address 10.0.6.50. With the basics covered, go to initial configuration tasks, select Add Roles → File Services. 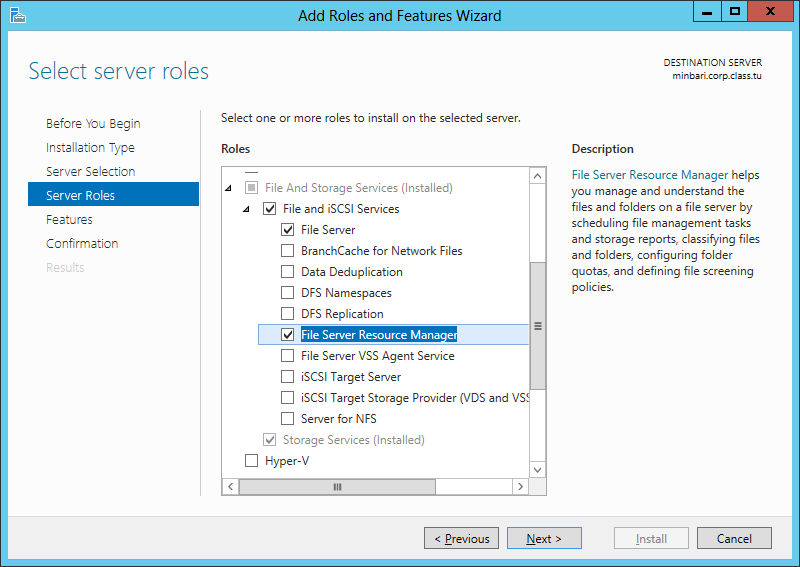 In this example, we install both the File Server and the File Server Resource Manager. Installation may take a bit of time. Once the installation completes, we need to create the shared directory that the approved domain users can use. 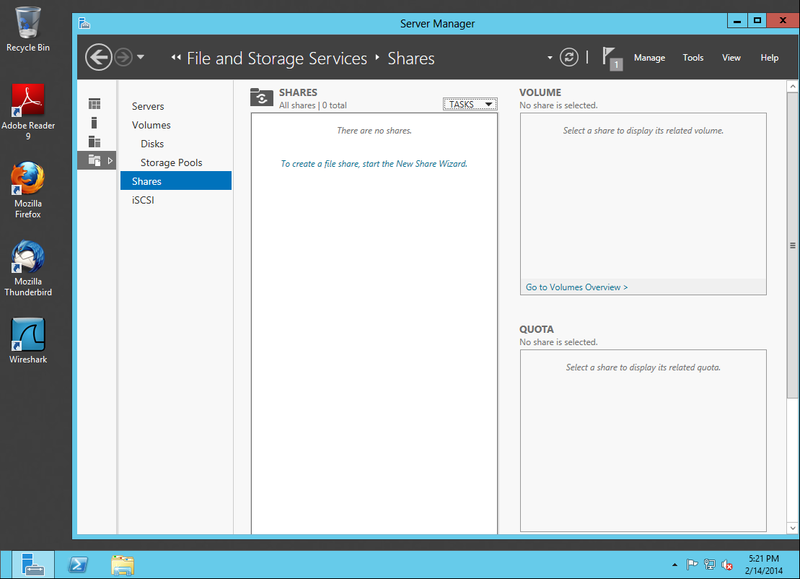 From the Server Manager, select File and Storage Services, then select Shares. From Tasks, select New Share. Two kinds of shares are available, SMB shares, which are a Windows standard, and NFS shares, which are an older *nix standard. For simplicity, let’s select a quick SMB share. Once selected, you first select the volume that will be used for the shares; the default c: is appropriate here. Moving forward, we name the share "CommonShare" and accept the default local path and remote paths. Leave the other settings in their default settings; we will now enable access-based enumeration and we will not encrypt data access. Next, and more important we need to specify the permissions that govern access. This process is greatly simplified from the settings in Windows 2008. Simply select Customize permissions from the menu. 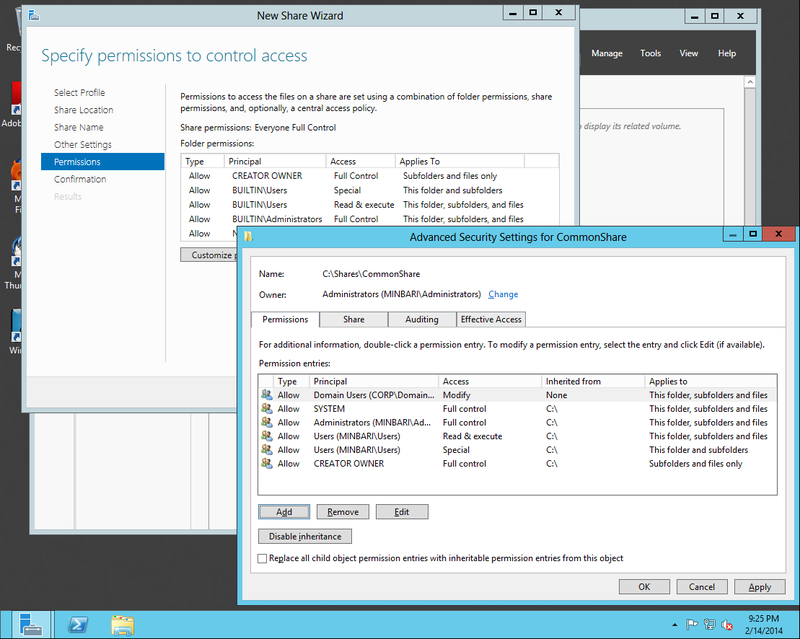 You can then customize permissions as needed from the Permissions tab. If we want to set up a common share for all domain users, we select Add, then select domain users, and grant Modify permissions, which includes read, write, and execute. After the settings are confirmed, the share will be created. You can also access the file share from Linux systems. Suppose that you are on a CentOS system joined to the domain; then from Places, select Connect to Server. 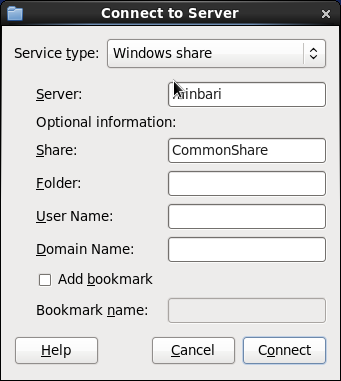 Add the name of the server and the name of the share; then select Connect. 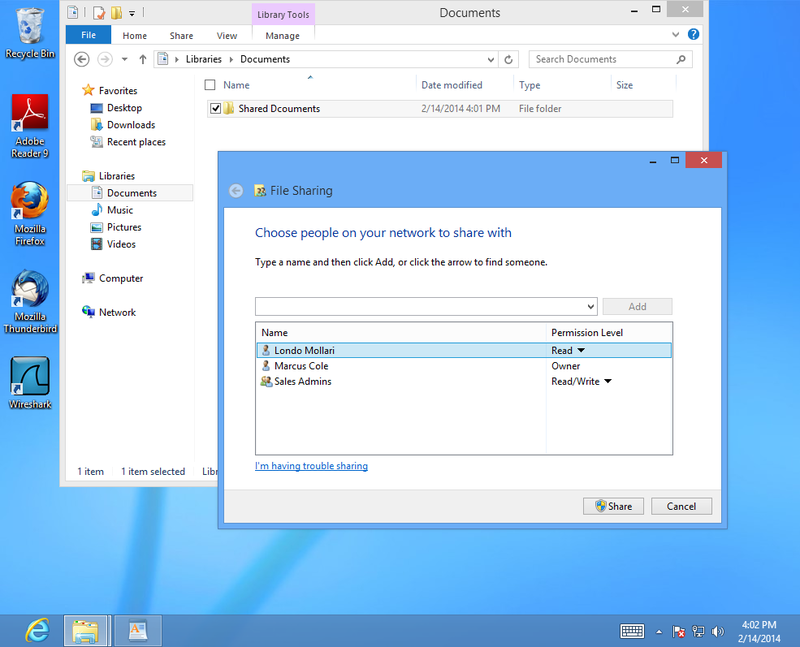 A network shared folder will appear on the Desktop, and you can browse the folder quite simply. The same process works on a Mint Cinnamon system. 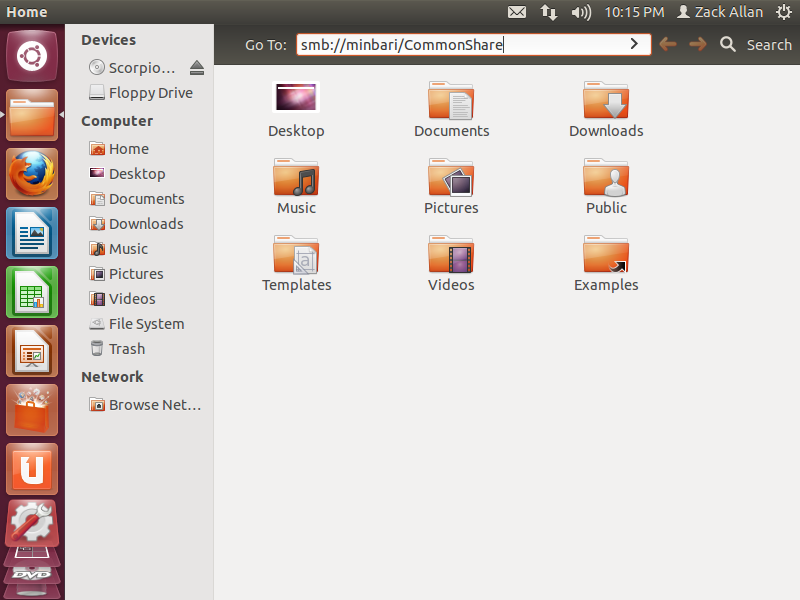 More generally, most Linux systems accept an address of smb://minbari/CommonShare in their file browser. In Ubuntu, you can startby browsing folders, then press ctrl+L to enter the name of the place. This will bring the user to the shared folder. 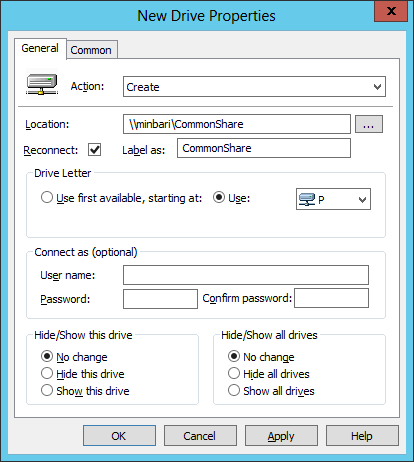 We would like each user to have a drive letter mapped to the common file share just created; this is done through Group Policy. On a domain controller, as a domain administrator go to group policy management and create a new group policy object- say “Common Drive Mapping”. 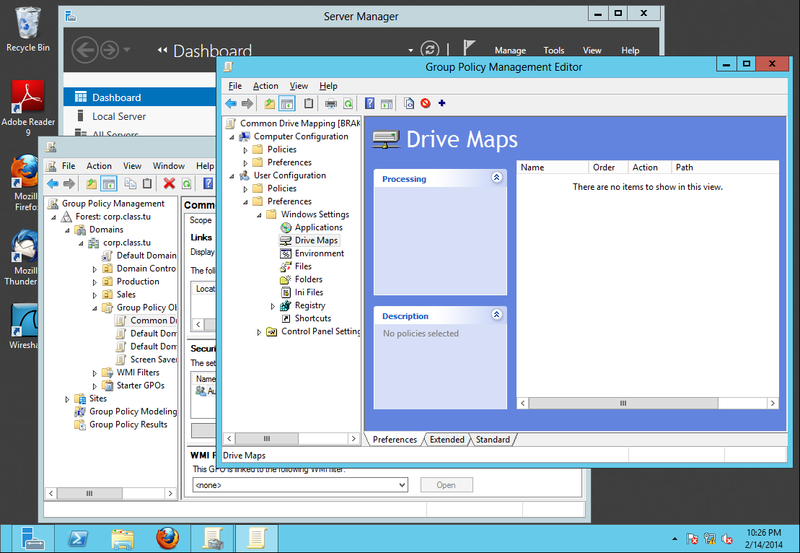 Edit that policy: Common Drive Mapping → User Configuration → Preferences → Windows Settings → Drive Maps. In the Drive Maps window, right click and select New → Mapped Drive. For Action, select “Create”; for Location, select the file share created previously. Be sure that you include both the host name and the directory for your share. Select a label for the drive share; select a drive letter- say P:\. Apply the result. Exit the group policy editor (with our policy now saved). Return to Group Policy Management; select Group Policy Management → Forest → Domains → “YourDomainNameWhateverItIs” (Right click) → Link an existing GPO → Select your new GPO, which this example calls “Common Drive Mapping”. Apply this policy. You do not need to apply this policy to the entire domain; you could simply apply it to one or more OUs. Log onto a machine in your domain; verify that the drive P:\ is now mapped to the file share. We can also set up a directory to provide an individual file share for each domain user. We start by creating the file share itself, so we head back to the file server, and from Server Manager make our way back to Shares. 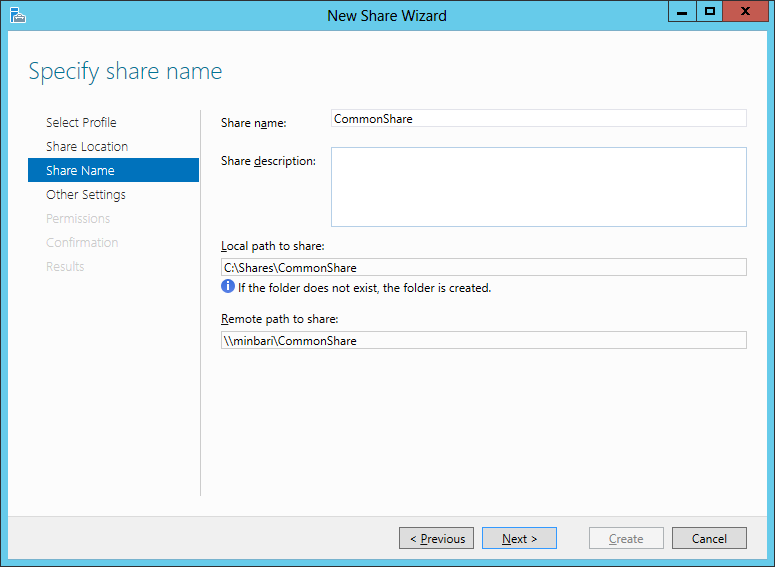 From Tasks, select New Share, and once again we will use the profile SMB Share - Quick. We’ll keep the same share location on the C: drive, but now the share name will be UserData; then the local path to the shared data is c:\Shares\UserData while the remote path will be \\minbari\UserData. Again, we leave the other settings in their default values, so we don’t enable access-based enumeration or encrypt data access. Once we get to the permissions section, we will diverge from our experience with the CommonShare. 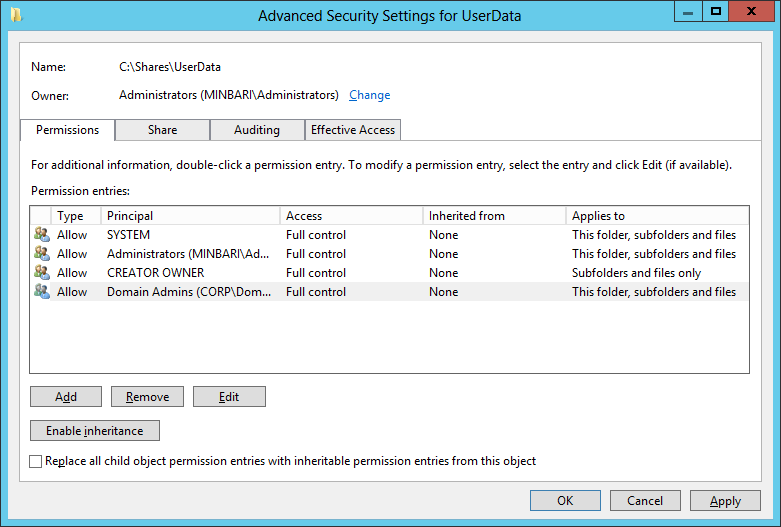 We Customize Permissions, and select Disable inheritance; convert all inherited permissions into explicit ones. With these changes completed, create the share. We repeat this process for each user. When you complete these tasks, you should also verify that you are unable to access the file shares of other users. I would love to say that this process is painless, but it is not, as for some unknown reason it takes some time for information about the new file shares to propagate out. If you log in and the shared drives are not there, you may need to reboot the system. If you want to gain graphical access to a Windows system, one approach is to use the Remote Desktop Protocol. Enabling an RDP server is quite simple. On a Windows 8 system as an example, from the Control Panel, navigate to System and Security, then to System. 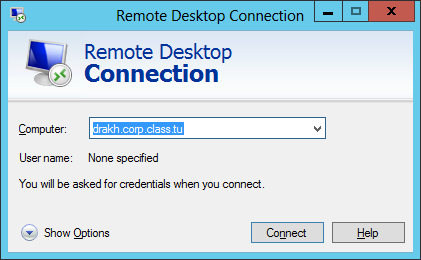 Select Remote Settings and pass through UAC. 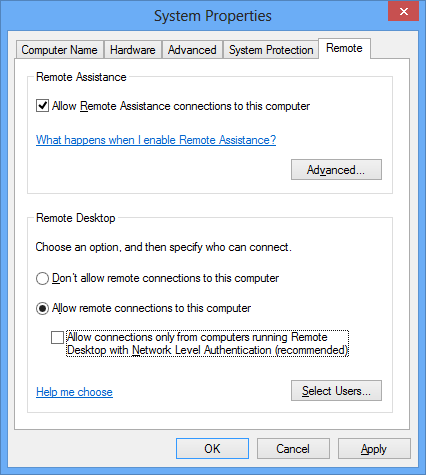 From the Remote tab, simply allow remote connections to the computer. One nice feature is that this will automatically open the proper ports in the firewall, at least for users on the domain and on private networks. In case you forgot, RDP uses TCP/3389 and UDP/3389. The situation on server systems is essentially the same. To connect to a remote Windows system, you can use the Microsoft Terminal Services Client; and you can launch it by running mstsc.exe. Simply enter the name of the computer to which you want to connect, then provide the appropriate credentials when asked. where the CentOS system has presumably been configured as we did for BIND to use the CD as a repo. 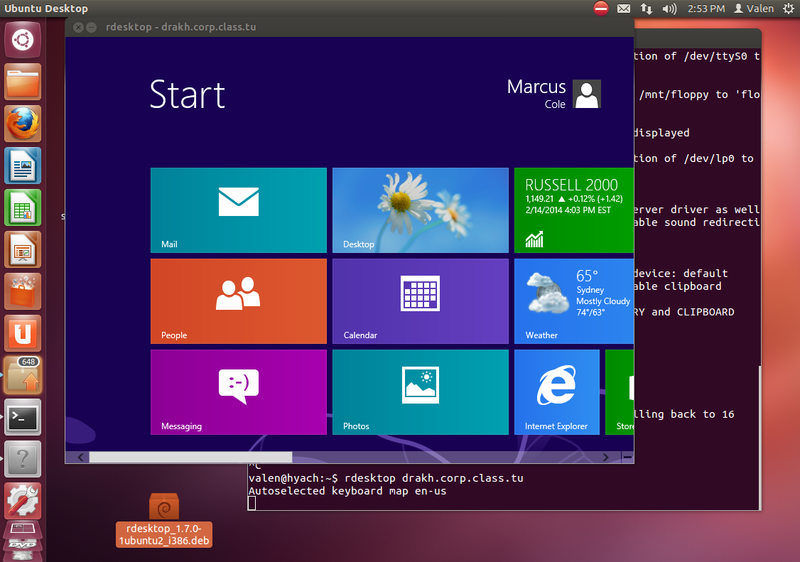 If you are online, a simple yum install rdesktop will work. By running a service like SSH, you are now explicitly allowing other people to access your system. To do so safely, you need to know what those users are doing on your system; this is the concept of operational awareness. Linux provides a number of tools to give you, the system administrator, information about what is occurring on your system. will start and stop the service, and we can ensure it starts on boot either via chkconfig or by navigating System → Administration → Services. 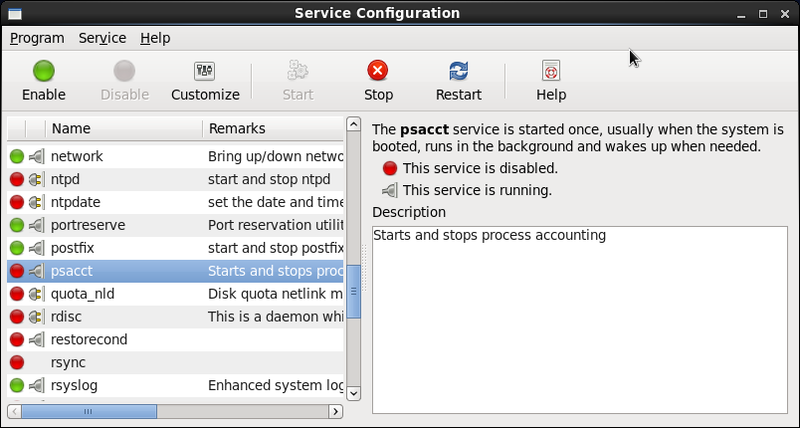 For Ubuntu or Mint systems the package is called acct, and for Ubuntu 12.04 / Mint 13 we use version 6.5.5-1ubuntu1. You can get the software from the labshare or directly from the Ubuntu software repository. Install it in the usual fashion. Ubuntu and Mint set up the package so that it will start and will start on the system’s next boot. The psacct package keeps track of a number of pieces of system information. For example, the command ac can be used to determine how may hours of connect time have been used. If you want to find out information about previously run commands, you can use the sa tool; it is able to give you information on the cpu usage of all of the commands run on the system. See the man page for more details. Who is Logged on the System? The command w can be used to determine who is logged into the system. Here we see three users logged in (CORP\zack, CORP\mcole) and valen, with two SSH logins from two different hosts. without the truncation of the user names. The data these commands rely on is stored in the file /var/run/utmp. This data is stored in the file /var/log/wtmp, which is why attackers often clobber that file before departing a system. Remember though, that this file is written when the user exits their shell, so it won’t have the history of commands in a currently running shell. What Processes are Running on the System? If you want a real-time list of processes running on your system you can use the command top; here is the output of that program at a particular moment. The processes are listed in order, with the processes using most CPU listed at the top. If your system is slow or sluggish due to heavy load, this is the place to start diagnosing the problem. Now we see SSH related processes from root, seldon, mallow, and hardin. What Ports are Open on the System? The command to determine what ports are open on the system is called netstat. When using netstat though, you should remember that Linux and Unix systems have two kinds of ports- network ports and Unix sockets. Unix sockets are used for communication by different processes on the same system, so in general we are uninterested in those. Here we were able both TCP and UDP ports in numeric form, and we also know the name & PID of the process that opened the port. What Resources are Opened by What Process? You can ask a broader question, namely what resources are being used by the system. These resources can be network sockets, but they can also be devices (like your USB drive) or files. The tool here is called lsof, and it can do a lot. Suppose you are concerned that a connection from 10.0.6.104 might be hostile. Can you find out what other connections come from that host? Sure! We can do more than just examine network connections with lsof. Suppose that you want to see what resources have been opened by all commands that contain the text "ssh"; then we use the -c flag; just be prepared for a lot of data. You can do the same by PID, just with the -p flag. What do we Know about a Process? Suppose you see a suspicious process. What can you quickly determine about it? A great deal of information about that process is stored in the /proc directory, in the subdirectory named after that PID. With all of this information, can you determine what PID 15895 was doing? As in the case of our Linux system, it is important to know what is occurring on our system. If you want to know the name of the process that opened the connection, you can add the -bswitch, however this requires administrator privileges. -t            Displays the current connection offload state. If you double click on a process, you can find out even more detail; if you double click on the jucheck process for example, you will be given a dialog box that lets you determine, for example, what TCP/IP connections that process has made. Here we see the process has connected to an Akamai server, almost certainly to tell me that my version of Java is old and out-of-date. 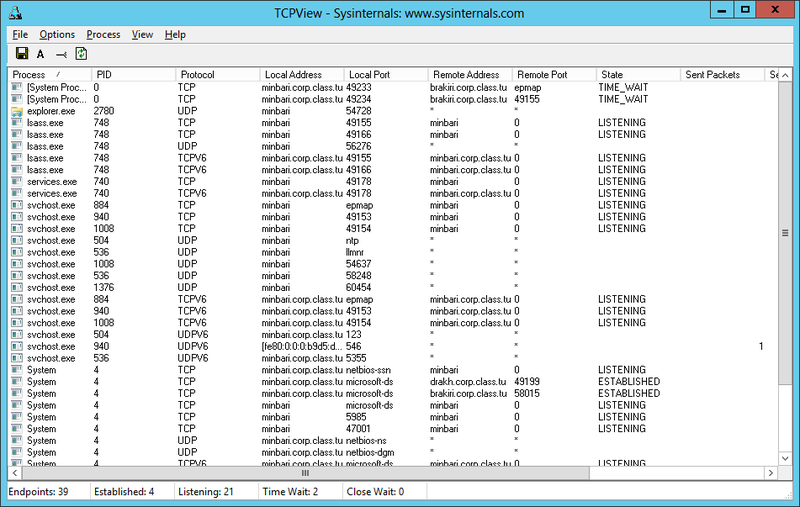 If your interests are solely on the network connections being made to and from your system, you may want to try TCPView. 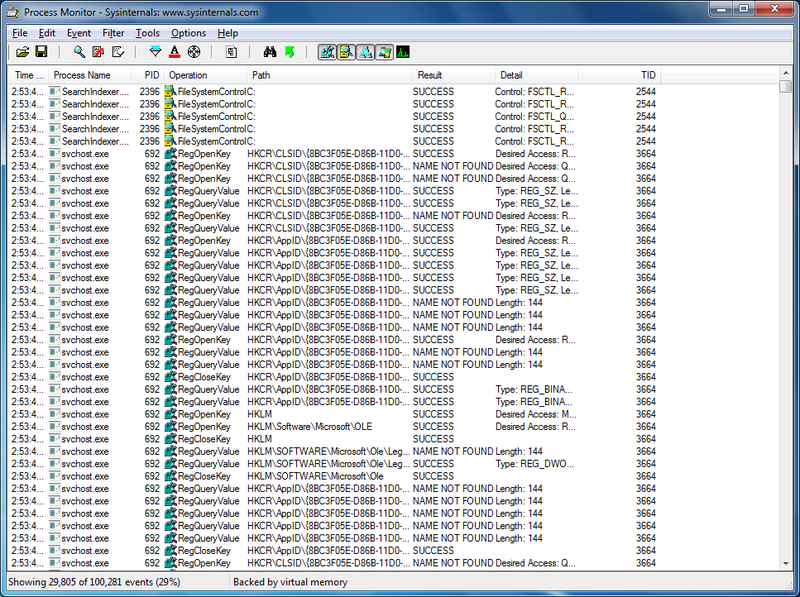 This is another Sysinternals tool that provides just this information; it even highlights new connections for your attention (in green). Here is what the tool looks like while running on our File Server. You can see the NetBIOS session and directory services connections. 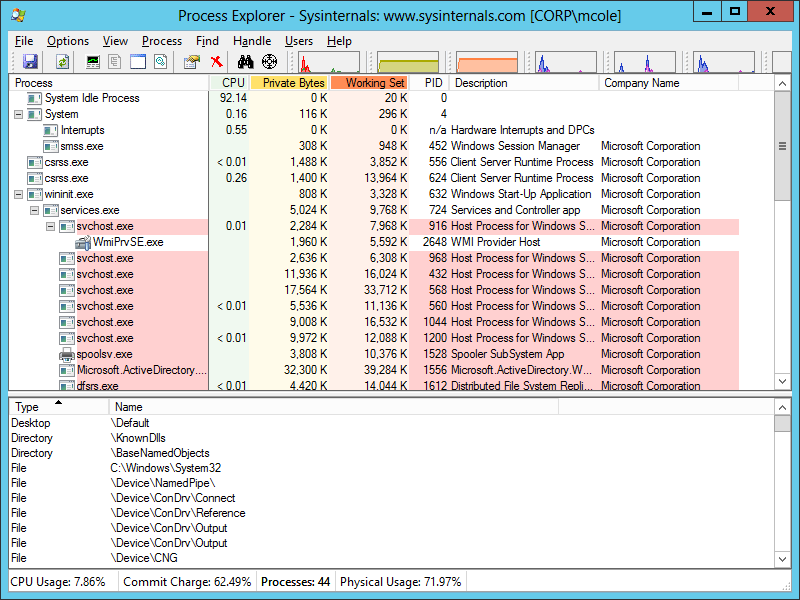 Process Monitor is another Sysinternals tool; it captures the different actions of the processes running on your system. If you want to analyze a process in detail, a great tool is ProcDot. This tool does not gather information like Process Monitor does, but rather it displays the results in a useful format. Installation of the tool is trivial, as it simply comes in the form of a .zipped executable; just be sure to run the 32-bit or 64-bit version as appropriate. WinDump, which is a Windows version of the venerable tcpdump. When the tool is run for the first time, it will ask for paths to these tools; simply provide them. You also need to record the packets; I prefer doing so with Wireshark. 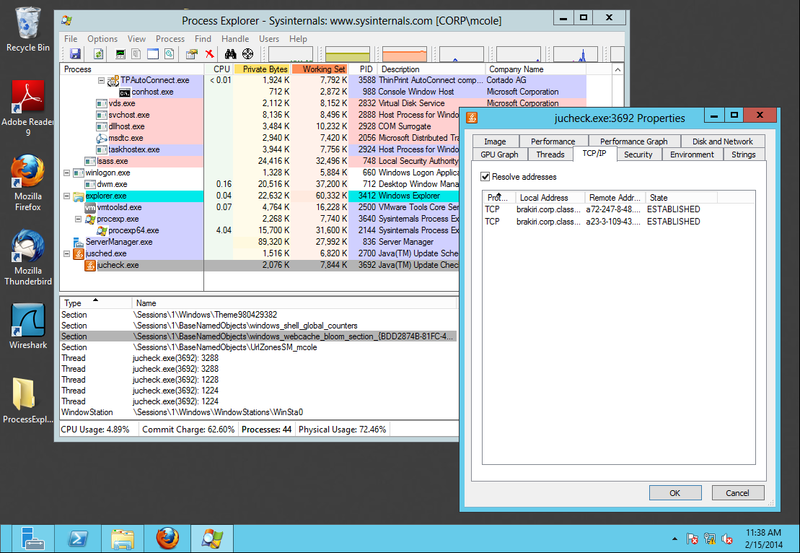 Once the activity you wish to monitor has finished, save the packet caputure as a .pcap file, and the Process Monitor data as a .csv file. Load both files into ProcDot, and select the Launcher button. It will take some time to ingest the data, but when it is complete, you will be able to select a process. Here is an example of the result; you’ll need to zoom in to get the details. The key to note here, is that this is an Internet Explorer process; looking at the graph you can see that it visited a web site at 10.0.2.250 on port 8080, then again came back out to the same host but now on port 4444. Some work was done in the registry, then a new notepad.exe process was spawned and execution moved to that thread. This is a classic example of a Metasploit attack on a browser; in this case the attack was MS12-063 Microsoft Internet Explorer execCommand Use-After-Free Vulnerability. Though ProcDot is fantastic for evaluating a process, remember that Process Monitor collects a lot of data, far more that could reasonably be stored over a long period of time. It is well suited for analyzing a particular piece of malware, but it does not double as an intrusion detection system. The next set of tools are the PS utilities. These are all command line tools that let you perform various tasks on different systems, provided you have the proper permissions. Here is a brief summary of the tools, taken from the Microsoft web page that describes them. The PSLoggedOn tool when run on the file server is able to clearly distinguish between who was logged in locally and who was accessing shares; this is an improvement over what we say with logonsessions which showed too much information. This is another Sysinternals tool. Unlike these others, it does not monitor your system. It merely sets the desktop background for your system on startup based on the values of various variables. If you have many systems, it is convenient when switching systems to see right on the desktop the hosts’s IP address, name, and other critical system information. BGInfo can provide that for you. Students first learning how to defend a network tend to have a consistent response towards suspicious processes- nuke’em from orbit as quickly as possible. This is often bad- even if the process actually is malicious. Killing a process deprives you of the chance to find out more about what is going on. How did the process get started? What processes are related? Has it opened a network connection? To where? Is that address connected to other processes? Take some time and look carefully at the process using these tools, and find out all you can about it, if it is malicious, and how they may have gotten in. Then you can decide what to do, and if appropriate, then nuke it from orbit.